Mahilig ka bang magsulat sa blog? Ito na ang iyong pagkakataon para manalo ng PLDT Cyberya Negosyo. Napakadali lamang manalo kayo bilis- sali na. Sundin lamang ang "contest mechanics." 1. To join, interested and aspiring bloggers must first “like” the PLDT KaAsenso Facebook page, and follow @PLDTCyberya on Twitter for updates. 2. Entrants must then write a blog entry about PLDT Cyberya. 4. Entrants will be given until January 6, 2014 to submit their entries, create links to their blog, and create noise for their entries. 5. Blog entries will be shortlisted to 3 Finalists after the deadline of submission of entries on December 10. 6. 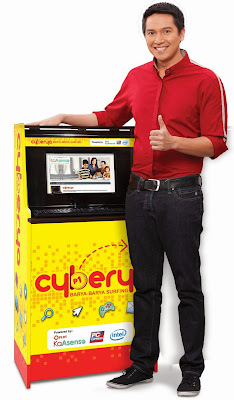 For the final round, the finalists will have Cyberya unit for two months where they experience running a Cyberya minigosyo, take home all the earnings from it and share their experiences with their readers and fans. They must write a creative and informative blog entry on their experiences of operating the Cyberya mini internet café. 9. Finalists’ entries will be seeded on SNS (Facebook/Twitter), but Finalists may also creatively create more noise for their entries, to increase the Virality score. 10. Only one (1) winner will be picked from the 3 Finalists. The winner will be selected through a combination of virality and content quality. Their prize will consist of one (1) Cyberya unit, with 12 months FREE Monthly Service Fee for PLDT KaAsenso Broadband Connection. 11. This contest is open only to Filipino bloggers. Employees of PLDT, its third-party suppliers, and their relatives up to the second degree of relativity and consanguinity are disqualified from joining this contest. 12. No purchase is necessary to enter this contest. Prizes are non-transferable and are not convertible to cash.